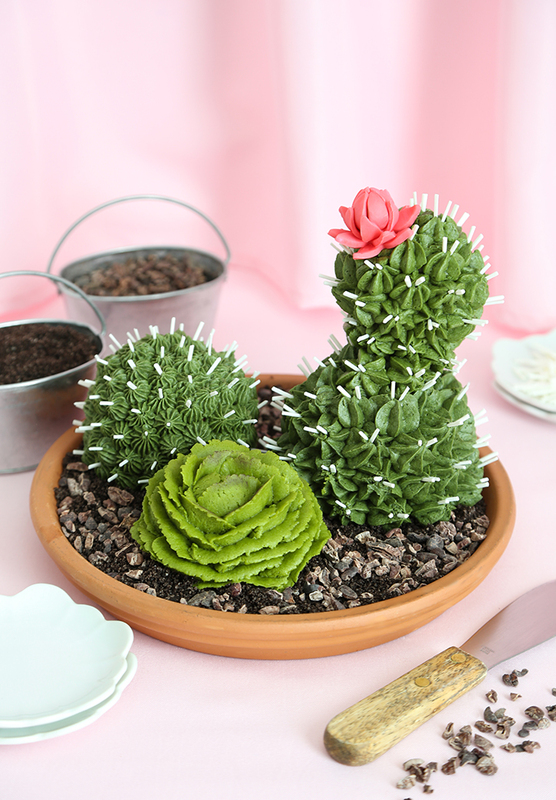 I hope you're not tired of seeing cactus cakes, because I have yet another to add to the ever-growing collection that fills our Instagram and Pinterest feeds. Lately I've been paying special attention to things that make me smile, and there's just something so funny - almost silly - about these little succulent cakes. I certainly had a laugh at the end of this project, not to mention a slice of lemon buttercream-covered cake! 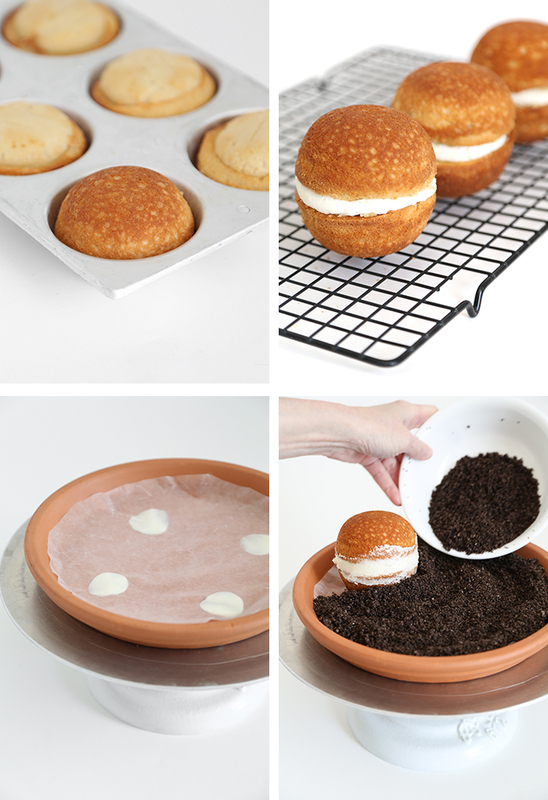 This project begins with cakes baked in a mini ball pan. I used this one made by Wilton with 3.5-inch cavities. The recipe is a simple white cake that can be endlessly varied. Lemon was my choice, so I added lemon extract in addition to the vanilla extract called for in the recipe. I purchased a 10-inch terracotta dish for my cactus cake planter. You can find these at garden centers and home improvement stores for just a few dollars. If you use one too, be sure to wash the dish thoroughly and allow it to dry overnight. Terracotta is porous and absorbent, so it's a good idea to also line the dish with waxed paper. A few dots of icing on the bottom of the dish will hold the paper in place. You could also use a 10-inch dinner plate or other food-safe dish and remove the need for waxed paper. Whole Oreo cookies pulverized in a food processor will make a potting soil lookalike, so that's what I used! It's tasty, too. If you'd like a sandy-looking presentation, swap the Oreo crumbs for graham cracker crumbs. 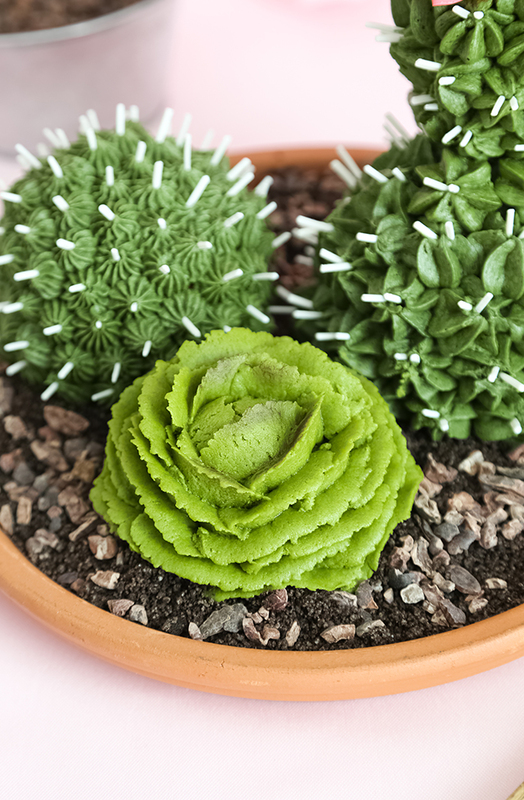 The cactus spines are made with white candy melting wafers. Just pipe lines of melted candy onto parchment, allow them to dry and then, chop chop chop them into 1-inch pieces. So easy! I used two different star piping tips to give each cake different character. The larger cactus is piped with Ateco #825 tip, and the smaller is piped with Wilton #32. It's not difficult - check out the video tutorial below! The small cabbage-looking succulent is piped with a large petal tip, Wilton #125. The piping technique is practically identical to piping a cabbage rose, and I just happen to have a video of that here! Definitely check it out for complete piping instructions. This portion is made with one half of a cake ball. The other half of the cake ball is cut using a large teardrop (or petal) cutter. It is used to form a lobe (or arm) on the cactus cake, and then piped with the large star tip. 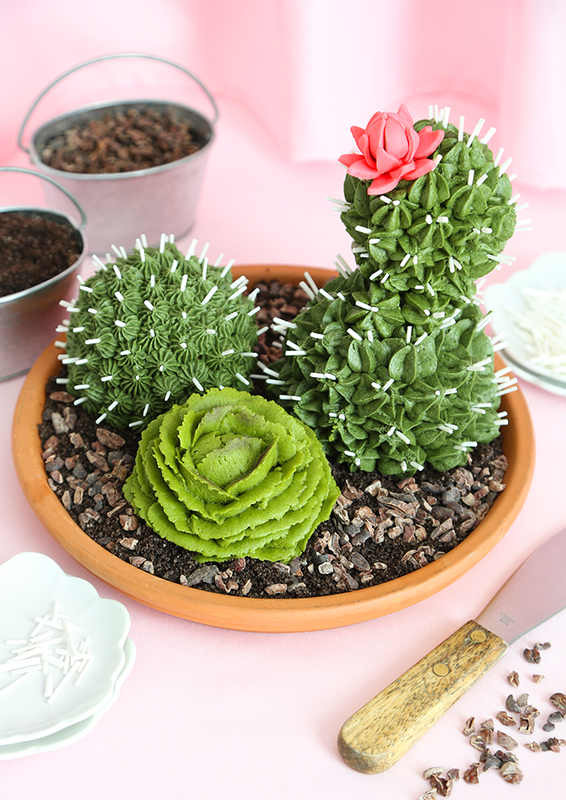 Pink ready-made fondant, a skewer, and a small 5-petal fondant cutter will make a quick cactus flower. If you're not into using fondant on this mostly buttercream-covered cake, then you could pipe a flower using a small petal piping tip and the instructions for piping the cabbage roses. If you're okay with fondant, then see my tutorials for making fondant flowers in my Bridal Bouquet Cake post. Cacao nibs give the cookie crumb soil a pebbly appearance, and you may recognize them from some previous cactus cakes I made here! This collection of mini cakes will easily serve 6 people. I recommend serving scoops of 'soil' along with the cakes, because the cookie crumbs are delicious and the cacao nibs offer interesting flavor and crunch! I used a new 10-inch terracotta saucer as a planter for my cactus cakes. You can find them at most home improvement stores in the gardening section. If you also choose to use a terracotta dish, be sure to wash it thoroughly and allow it to dry overnight before using. Mix flour, sugar, baking powder and salt in a large bowl. Add butter and milk; mix on low speed with an electric mixer. Add vanilla and increase speed to medium, beat for two minutes. Reduce speed to medium-low and gradually add the egg whites in two additions. Beat at medium speed for 2 minutes. Pour batter into the cavities of the prepared pan and smooth the surface lightly with a rubber spatula. Bake the cakes for 20-30 minutes, or until the tops are golden brown and a toothpick tester comes out clean. Let the cakes cool for 10 minutes in the pan before turning them out onto a wire rack to cool completely. Level the tops of the cakes with a serrated knife. Make the buttercream: Combine the butter and confectioners’ sugar in a large bowl. Beat on medium speed until combined. Add the lemon extract and mix well. Add milk or cream 1 tablespoon at a time to thin the mixture to piping consistency. Beat at high speed for 3 minutes or until light and fluffy. Remove 1 cup of frosting and transfer to a disposable piping bag with a 1/2-inch hole snipped in the end. Divide the remaining buttercream in half. Tint one portion with the juniper green food color and a little of the yellow gel food color until a deep green cactus color is achieved. Divide green frosting in two portions, and transfer one portion to a piping bag fitted with Ateco piping tip #825 (7/16” open star). Transfer the other portion to a piping bag fitted with Wilton piping tip #32 (open star). Tint the remaining portion of buttercream with yellow food color, and a little juniper green food color until a yellow-green color is achieved. (You should use more yellow food color than green.) Transfer the frosting to a piping bag fitted with a Wilton tip #125 (large petal). Pipe a thin coat of the untinted frosting onto three of the cooled half ball cakes. Sandwich each with another half ball cake. Chill cakes until firm, about 10 minutes. 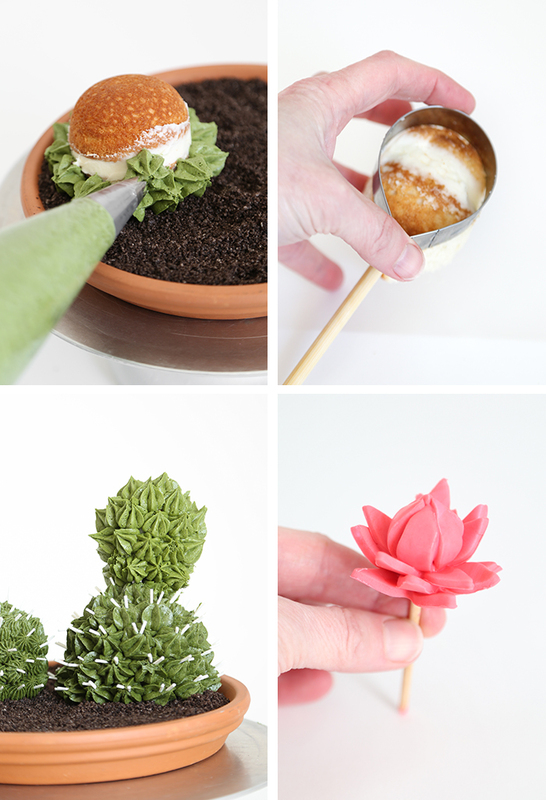 Using some of the remaining buttercream, place four dots of frosting in the saucer or planter dish. Line the saucer with waxed paper (the frosting will help hold the paper in place). Add another dot of frosting and place a ball cake on top of the dot. Surround the cake with the cookie crumbs, filling the saucer. Cover the ball with frosting stars using the green frosting fitted with the #825 Ateco tip. Place a second ball cake into the planter, spacing it about 2 inches from the first. Cover the second ball with frosting stars using the green frosting bag fitted with the #32 Wilton tip. Cut the third ball cake in half. Use a 2.5-inch tear-shaped cookie cutter to cut a piece from one of the halves. Place a 4-inch long wooden dowel or skewer into the pointed end. Insert the wooden dowel into the top and slightly off-center into the first cake (piped with #825 tip). Cover with green frosting stars with the bag fitted with the #825 tip. Pipe overlapping petals on the last ball cake half using the yellow-green frosting fitted with the petal tip. Keep piping petals until a large cabbage shape is achieved. (See blog post for further petal-piping instruction). Refrigerate until firm. When the cake is firm, transfer to the planter dish. 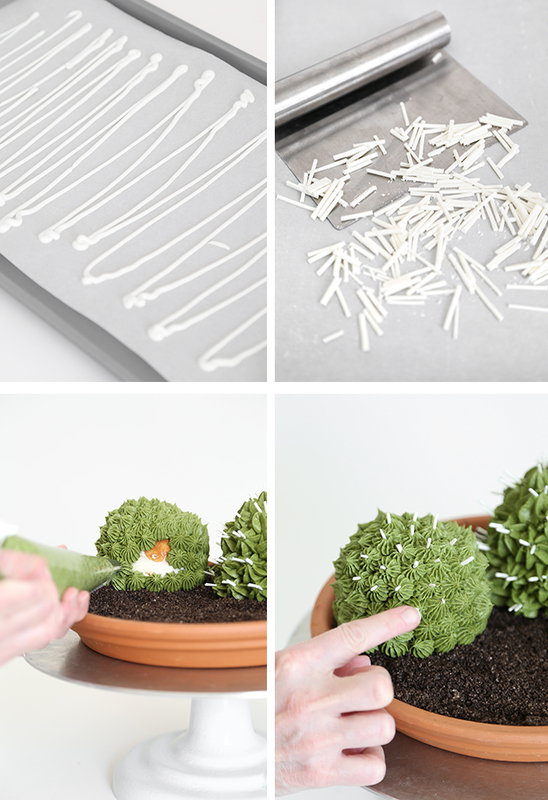 Make the cactus spines: Line a baking pan with parchment paper. Heat the white candy wafers in the microwave at 30 second intervals until the candy can be stirred smooth. Transfer the candy to a disposable piping bag snip a small hole in the end. Pipe thin lines of candy onto the parchment paper; let dry until firm. When the candy is firm, use a knife or bench scraper to cut the candy into 1-inch pieces for the spines. Press two spines into each of the large stars piped onto the first cactus cake (#825). Press one spine into each piped star on the second cake (#32). 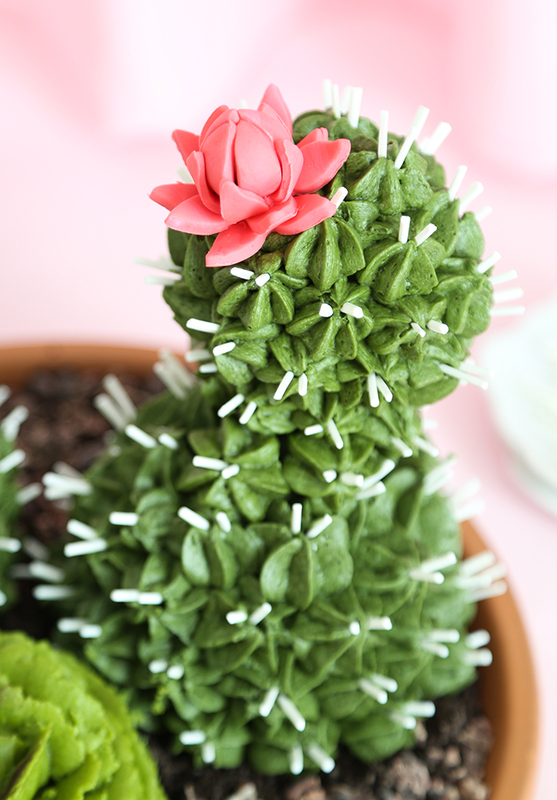 Make the pink cactus flower: Roll the pink fondant to 1/4-inch thickness. 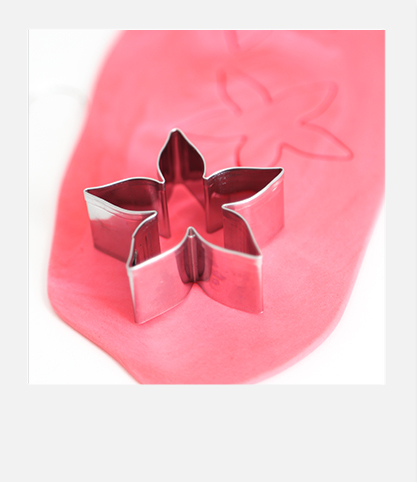 Use a small 5-petal flower cutter to stamp 4 pieces from the fondant. Roll a small scrap piece of fondant into a ball. Place a skewer into the ball. Thread one of the flowers onto the skewer and brush the inside of the flower with water. Fold the petals upward to a closed position around the ball. Thread the other flowers onto the skewer, staggering them so the petals do not line up with each other. 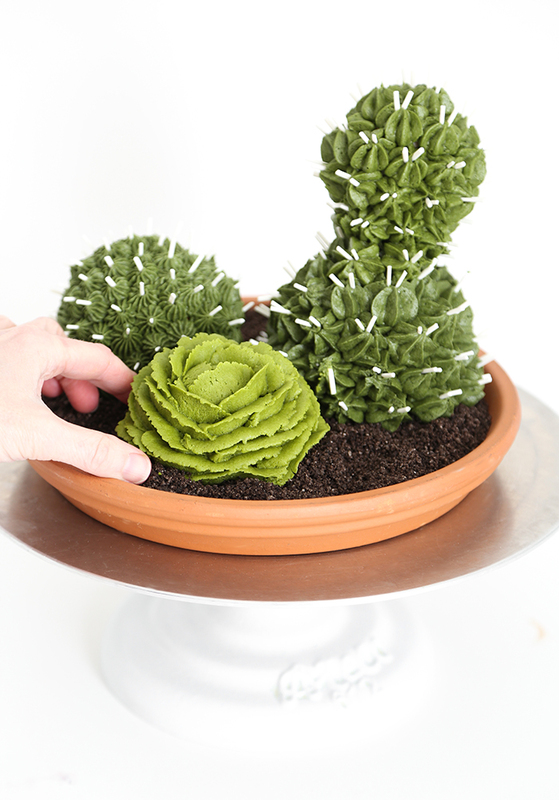 Cut the skewer to 3-4 inches using scissors, and insert into the top of the cake piece on the first cactus piped with #825. Finish the cake by garnishing the cookie crumb ‘dirt’ with cacao nibs. Adorable little edible garden! Totally in Love with it !! Oh my!!! Those are simply gorgeous! Wonderful idea as usual! They are simply amazing. I would love to try this. Thanks.